Who was William Bracegirdle and what does he represent? He was a fisherman of Greenwich, but he was not the only fisherman in the area. There must have been thousands over the centuries and there were many in William’s time. Since early times fishing had been an established way of life for many along this ancient River. It helped feed the local people and was an important part of the community. Records of the fishermen are almost non-existent. It was how they made their living and cared for their families. There was no time to record their day-to-day lives, and apart from the odd newspaper report of catches like whitebait (for the famous whitebait suppers so beloved of politicians and the better off), or the odd beached whale which had strayed upriver, very little is known about them. Their skills and abilities in fishing and in sailing, plus a goodly dash of luck, were what determined their futures. There were others too, boat builders, sail makers, a myriad of small supporting industries and the people who ran them, depending on each other and the River Thames and the sea for their livelihoods. 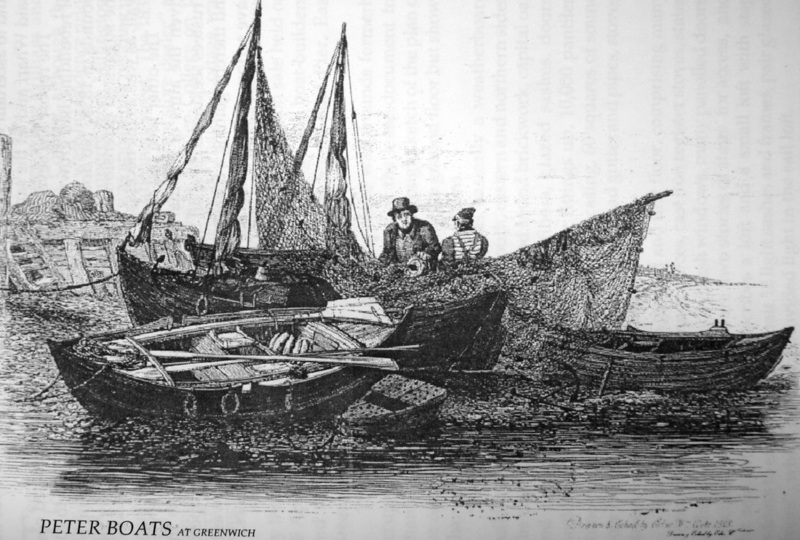 Greenwich was a convenient place for fishermen, particularly those who took their small and fragile craft into open waters. They could take their catches upriver to be sold in London and return here to live with their families. Many did not return, and died at sea in storms. The use of the River Thames has changed over the years as well. Imagine what it was like over one hundred and fifty years ago, the busy eternal passing vista of sailing ships, fishing smacks, small steam tugs towing emigrant ships to and from the wharves, watermen rowing across with passengers, sailing barges, some loaded with hay and travelling upriver for the horses of London, barges crewed by lightermen delivering goods and cargo to a vibrant city, doing basically what trucks do today. This was part of William Bracegirdle’s world. He was born in London in 1782, one of several sons of a coachmaker Philip Bracegirdle and his wife Ann. He became a master fisherman, a fishmonger, the owner of many fishing smacks, a leaseholder of Morden College and he owned and ran several businesses. He was a worthy entrepreneur of Greenwich. He had many connections and attended dinners, political meetings and contributed to the life of the community. In order to gain entrance to a trade on the River one required contacts. Early records of his life have proved elusive, however. William began as a lowly fishing apprentice of a fisherman, John Mann, in 1795, one of many John Mann apprenticed over the years. He married Deborah Baring in 1803 and they had one son, also a William George Bracegirdle. I suspect but cannot prove that as a journeyman he may have moved away from Greenwich for a time. But he returned and by 1820 he was renting a house at Number 2 Bennett Street (now Hoskins Street) from Morden College, and there is evidence that he may have built this house for the College and others in Marlborough Street, as part of his rental agreement. His business must have been doing well. In 1827 he was a fishmonger at Crowley’s Wharf, and had Rag, Rope and Marine Stores at Bennett Street and on Crowley’s Wharf. 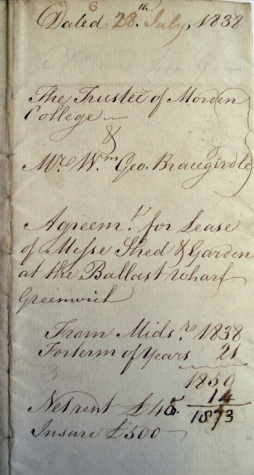 In 1826 he became a yearly tenant of the Ballast Quay, but in 1829 he sent a letter of Morden College offering to “quit the Wharfe situated near the Union Tavern Greenwich, on or before the 25th December next”. He and others continued to use the Ballast Quay, despite its parlous condition, until William took out a new lease on the Wharf in 1840, after it had been repaired and refurbished. He and Deborah were at this time sub-leasing Thames Cottage, an old house which was on the site of the current Harbour Master’s Office, from Isaiah Millington, the lessee of Crowley’s Wharf. From the Morden College notes, it was their desire to have the Ballast Quay as the private property of Morden College and to control who used it. William tried very hard to achieve this end, and for his trouble ended up in a long battle and a costly court case with the Parish of Greenwich. This was probably the beginning of his financial woes and ultimately the end of his career. After losing the court case, being an enterprising person, he must have been thinking of his families and his future. He had some sort of agreement with Mr. Coles Child, who leased the land next door. Mr. Coles Child had many inspirations for the use of his lease, including at one stage a soap factory (the nearby tenants objected to this obnoxious industry). William decided that because of the development of passenger traffic, he would build a pier on Ballast Quay, which from reading his letters must have had some input and encouragement from Coles Child, at that time a young man with ideas. So they built the pier. William then found himself in a shocking situation, because even though it was a floating pier, it was built in the wrong place and he was instructed by Morden College to move it. He had spent many hundreds of pounds and mortgaged his lease of Thames Cottage, at a time when the fishing industry in Greenwich was declining. It seems he was being asked to repay Coles Child, who for some reason would not back him any further. William had no more money and no means to earn more. I believe his son must have died by this time, because his business appears to have gone. 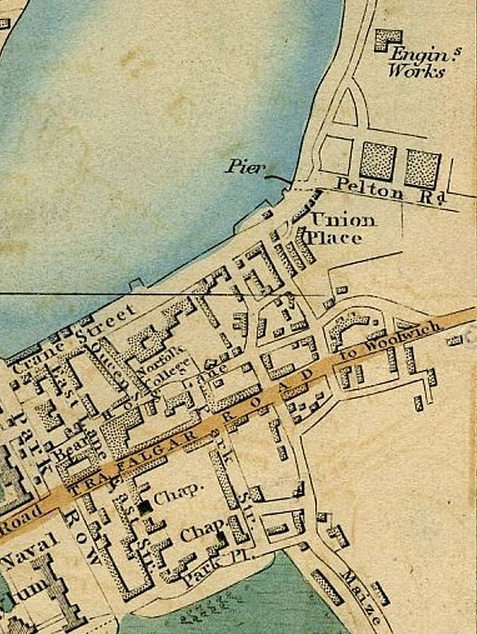 The pier itself is shown on a later map, Cross's New Plan of London. His only response in 1849 was to try and sell the lease of Thames Cottage and his remaining fishing smacks. One, the Samuel and Mary Ann, must have been sold as it was reported sunk off Blackhead on July 1st 1850. He also sold off a substantial amount of goods and furniture. In 1849 he also apprenticed his grandson, Frederick Bracegirdle, as a fisherman, and transferred this apprenticeship to the ill-fated Southern Whale Fishery Company, set up by the grandsons of Samuel Enderby. Since the publication of “A Fisherman of Greenwich” in 2001, we have traced William’s antecedents back another couple of generations and discovered some quite interesting facts. To get an apprenticeship on the River, one needed connections. William’s step-grandfather was a lighterman, also his uncle George, and his father was a coachmaker, so there was that important factor, connections to the Livery Companies of London. 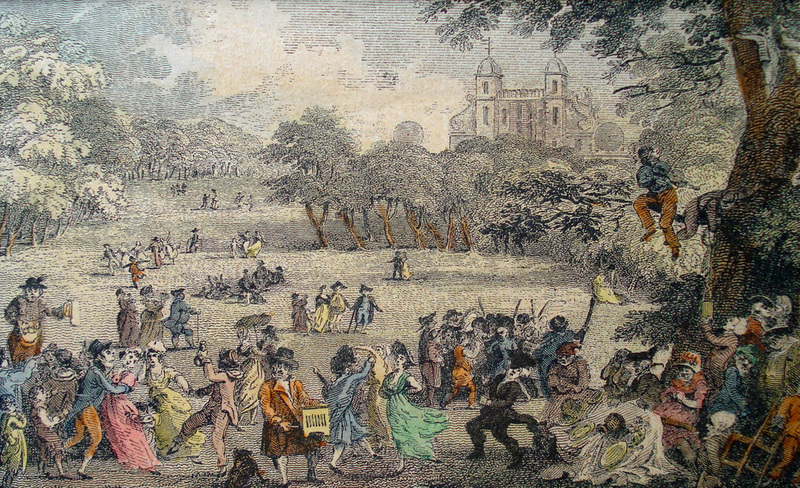 In Greenwich the fishermen were able to apprentice poor boys to the trade to keep the industry supplied with more fishermen. But generally it was not easy to gain an apprenticeship on the River. From newspaper reports, William seemed sympathetic to the privations of the poor. In 1838 there is a newspaper report where William moved a motion at a meeting held at the London Tavern “that young offenders be trained and encouraged to move to the colonies”. He is also reported in many small court cases, one involving a young lad who had stolen property from William’s smack, and was convicted and sentenced at the Old Bailey to seven years transportation. I wonder what his reaction was to this outcome! History does not relate, but perhaps he was not impressed. Another case showed where he offered to take on a destitute lad. Because of the slowness of the court decision this unfortunately did not proceed, as the lad turned up sometime later very emaciated and died. In 1848 he applied to Morden College to lease a small plot of land on which to erect a ragged school, which was not granted. William must have been an interesting fisherman/fishmonger and spread his business far and wide. I have found traces of an industrial lease he held in Scotland, and evidence has come to light recently that he was in Norway in May 1836. He was on a fishing trip to collect the choice lobsters harvested from the clear waters, but while there he also delivered a Bible to the church at Aukra on the island of Gossa. Having been shipped back to England, the lobsters would be kept alive in lobster chests he purchased around 1822 from the previous owner of the smack Samuel and Mary Ann at Holehaven on Canvey Island. The River Thames in later years was showing signs of excessive pollution and any live fish or lobsters would not have survived in the waters off Greenwich. They must have sold oysters from Whitstable (his son married Susanna Jutson, a daughter of an oyster fisherman). Salted fish were also an important part of the trade in the days before refrigeration and some smacks had a well, open to the sea, which kept fish alive until they returned to port. But the fishing trade from Greenwich was dying. The expansion of the railways in the 1850s enabled the fast delivery of fresh fish to London, avoiding the long sail home and up the Thames to the London Markets. Many of the fishermen of Greenwich moved themselves and their families to new ventures in Grimsby. One of William’s grandsons, the third William in the family, did so as well, after an apprenticeship as a sailor, and started his own enterprise there. Grandfather William, even in his advancing years, continued fishing from Greenwich until he was no longer able. He must have been devastated by the failure of his last enterprise which, if it had worked, would have given him a retirement income and security for his family. Perhaps if it had succeeded there would have been no Australian or New Zealand branches of the family. William and Deborah moved to the Queen Elizabeth College Almshouses in Greenwich in 1858, a place for the notable poor of Greenwich, and both died there in 1863. They are buried in the Shooters Hill Cemetery, now the Greenwich Cemetery. Greenwich is a remarkable place. This area is where, in the years before William died and after his death in 1863, entrepreneurs in other industries made an astounding contribution to England and the modern world. It is all gone now, change has come and where once a multitude of developing industries flourished, accommodating people has become the priority. I hope Ballast Quay will be regarded as a permanent memorial to all of the fisherman who took part in what is now a vanished industry, one among many in this outstanding area of England. Boat building and fishing were flourishing trades on Ballast Quay in the early 19th century. Clinker built row and sail boats such as these were used to catch fish in the Thames and to deliver their catch to the local markets and businesses. Fish formed a large part of the staple diet at the time. 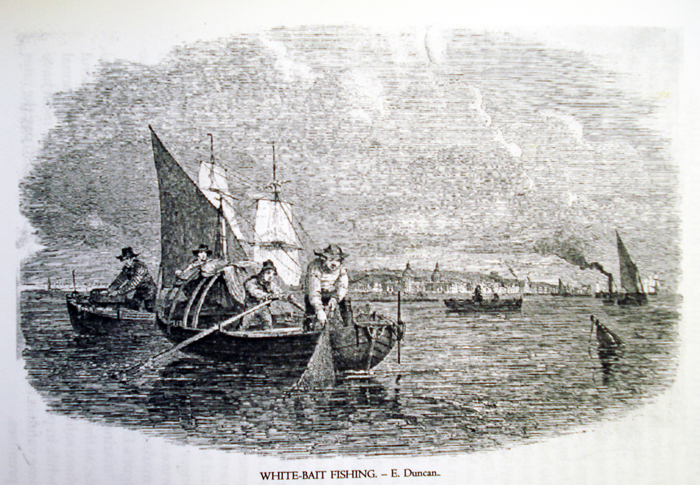 There were fish markets in Greenwich and the river was full of whitebait and herring, which found a ready made market in the riverside taverns. coming by every available form of transport. This must have been a factor in persuading William Bracegirdle and William Coles Child of the viability of building the Steam Boat Pier at Ballast Quay in 1846. 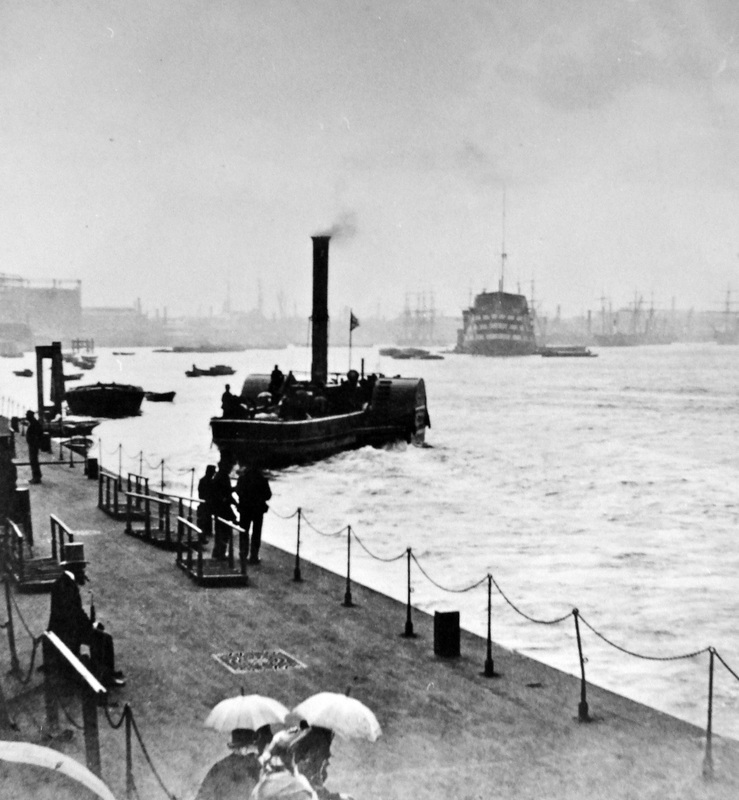 Travel by steam boat was a popular form of transport before the advent of the railway in 1836, when the world’s first suburban railway service connected Greenwich to Central London. The line did not reach East Greenwich at Maze Hill until 1878, when the tunnel under the Royal Hospital grounds was completed. The opening of the South Eastern Railway to Dover in 1844 had already had an impact on the fishing industry in Greenwich, forcing fishermen to relocate to coastal fishing ports. Similarly, from the 1850s steam boats declined in popularity as a means of transport. This must have contributed to the demise of the East Greenwich Pier built by William Bracegirdle and William Coles Child in 1846. Cross's New Plan of London 1850 shows the position of The East Greenwich Steamboat Pier, located at the end of the new Pelton Road. Julie Tadman's book A Fisherman of Greenwich can be ordered through the Contact page of the website for £10 plus postage.